Can a handknit shawl really help someone heal quicker? I hope so! When we were at my Mom's house a couple of weeks ago she had a gorgeous throw/shawl on her couch. Horsey Girl wrapped herself up in it and I thought she wasn't going to give it back. My Mom said she had made it out of Lion Brand Homespun and that it was called a Prayer Shawl. Now I tend to be a fiber snob but this thing was so soft and amazing I just had to make one. I went to Michaels the next day and bought yarn for not one but TWO of these things. A gorgeous pink to make Horsey Girl one of her own and an incredible deep red for a friend that is having back surgery. This photo does not do it justice no matter how hard I tried. The red is like a deep wine red and just wonderful. The pattern that is on the Lion Brand website has you knitting and purling sort of making some boxes but in reality they don't really show up on this yarn. For HG's I started with that pattern and then just went to straight knitting after about 10 rows. Also the yarn calls for size 11 needle but it wasn't turning out as soft as Mom's. She said she used a size 13 so I frogged the whole thing (SIGH) and started over on size 13's. It was the right move. 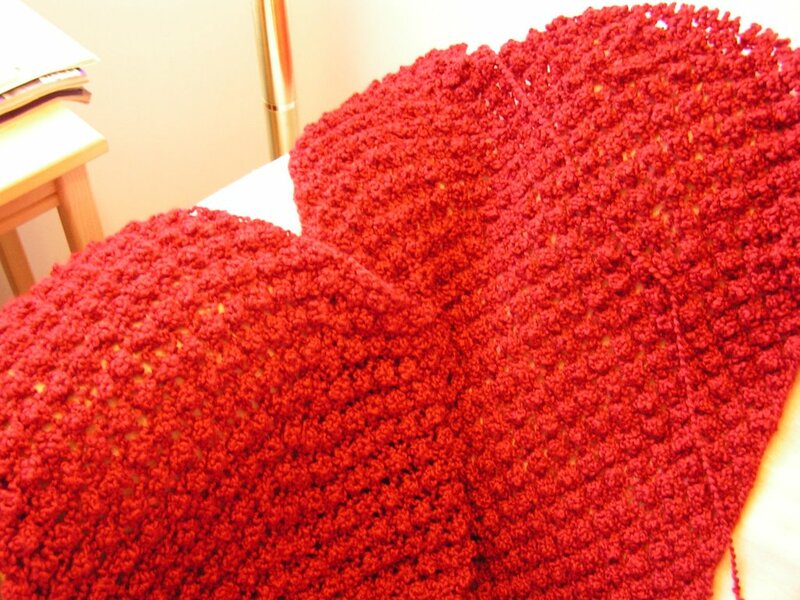 Why is it that things turn out softer when knit on bigger needles? Since my friend's surgery was coming up I put down HG's blanket to start the red one. 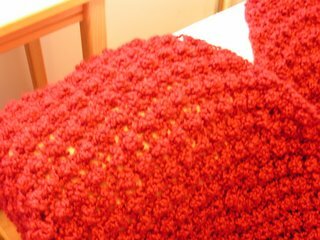 I was surfing around the web and found another prayer shawl pattern in something called the trinity or blackberry stitch. It looked really pretty so I decided to try that and I'm really happy with how it is turning out. Here is a close-up look. Now I'm not real religious but I think of it as a healing shawl. I have been thinking good thoughts for her speedy recovery while I make it and hopefully knowing you have someone who cares about you enough to make this helps your overall health. I'm just about finished which is good because her surgery is tomorrow! Now I may just have to make one for myself!